No sew mojo - Stop staring and start sewing! 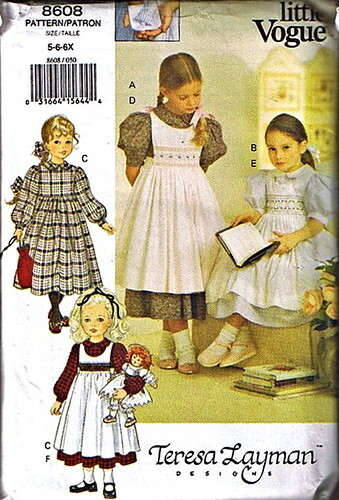 I just don't have the desire to sew anything for Easter this year. Maybe it's because it snuck up on me too fast. Last year I did a pretty good job pulling it together so maybe I should just plan on it being an every other year thing. 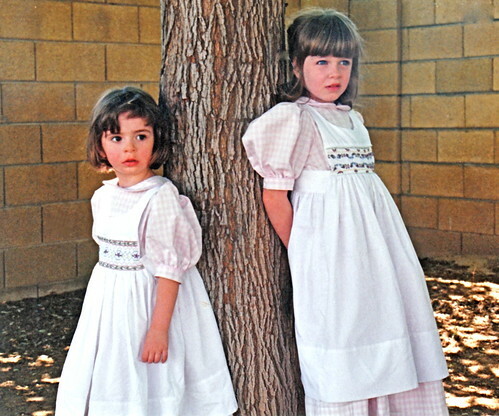 When my girls were little I seriously went all out in my Easter sewing and usually ended up staying up until 3 in the morning hand stitching their hems (which they would promptly snag under their cute little white shoes and pull out, ugh). Now I machine stitch all my hems (so they don't count as heirloom but I don't care). 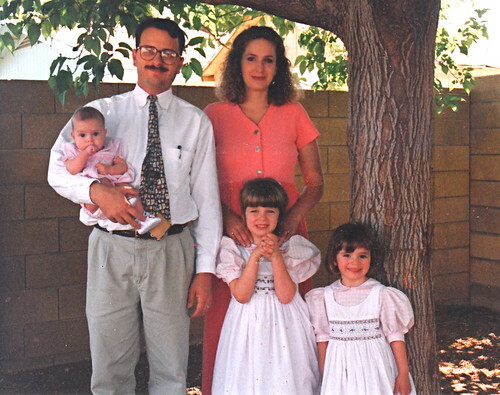 When we first moved to Arizona I was determined to learn to smock. Looking back I realize I must've been very determined because I had to arrange babysitting for my two toddlers (my mom I'm sure) and drive up to parts unknown where I found an embroidery shop that had lessons (30.00 for two lessons). And after that I would drive clear up there to drop off my fabric so they could machine pleat it until I finally scraped together 125.00 for my own pleater (I don't even know how I managed to do that since we were so painfully poor!). 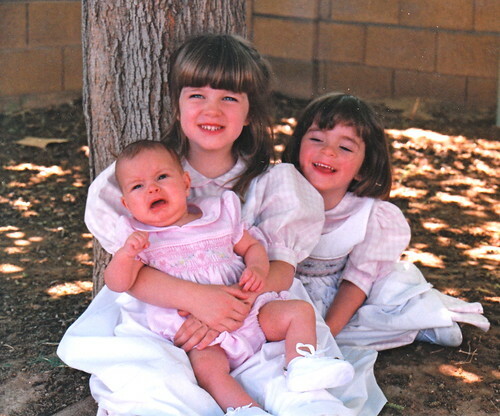 In 1997 I had three beautiful little girls (which I always wanted. These boys really threw me off!) and I decided to go all out for Easter. I smocked for 5 weeks!!!! Silly me, when the Vogue pattern envelope said "Advanced/Difficult" I thought "no problem! I'm sure I qualify as advanced! 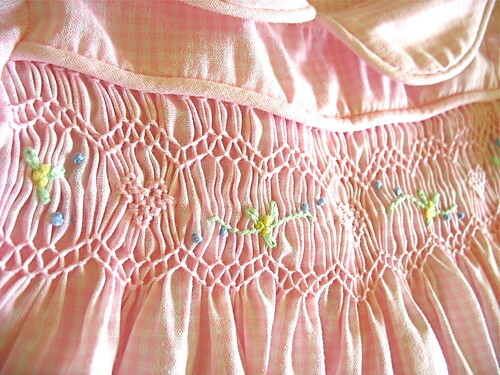 I've taken smocking lessons!" Here are the finished dresses and I have to say, they were really beautiful. Olivia's (on the right) took the most work because it has dozen of bullion roses smocked on it (ugh). Peety's just has lazy daisies and was so much faster. I can still remember ironing those sleeves. Here's a tip for ironing puff sleeves: Put a blow dryer up the sleeve hole and turn to high/hot. Spray the sleeve with starch and wait for it to dry (just a few seconds). Perfectly poofy! 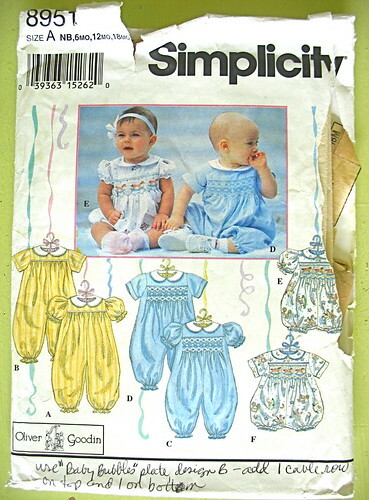 I used this little pattern for Sofia (she was 4 months old) and it was sooo much faster. I did a darling bonnet using one of Kitty Benton's patterns and it was so sweet but I'm not sure where it is anymore. She was one of the happiest babies I had and yet I have so many pictures where she's crying. I don't get it. And I can't believe I let them sit on the dirt! I still have her jumper. Here's a closeup of my handi-work. And here's the whole fam! I don't like too many pictures of myself in my 30's and now I realize it's because I was so darn exhausted. Have a beautiful Easter Sunday!